Senyuan Furniture (International) Group is a largest luxury furniture and hotel furniture manufacturer in China. They are the leader of furniture industry, leading the development trend of China furniture industry, The are the most famous and influential furniture manufacturer in Asia. Since 2003, Senyuan Furniture Group already cooperate with Italy Moma Design company, they import the Moma Casa modeling and structure design, launching their new brand Senyuen products to the world. To feel the world top furniture and interior design in noble style, to experience the trendy and elegant lifestyle. 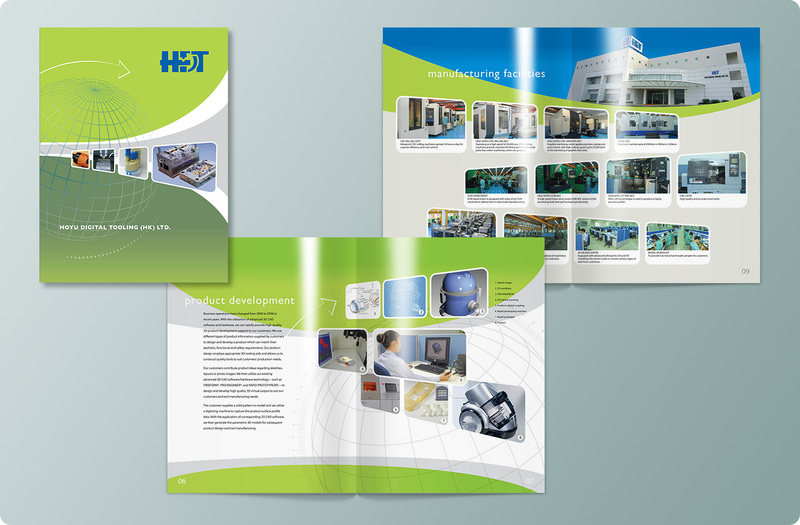 The brochure designed in simply high class style, total 100 pages including the group introduction, total solution and a successful case study. Using all artistic furniture design to represent their different theme and contents. 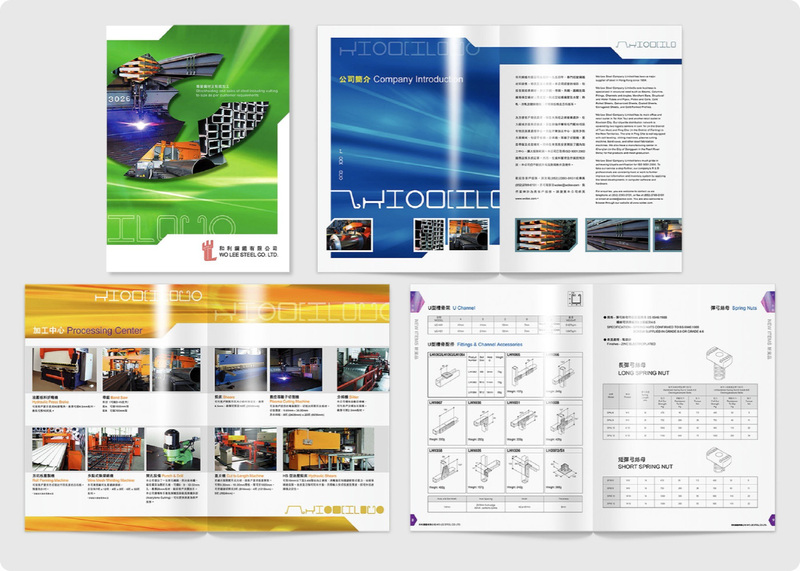 The layout design is atmosphere, active but clear to show customer that Senyuan Furniture Group's power and product information with international graphic technique. 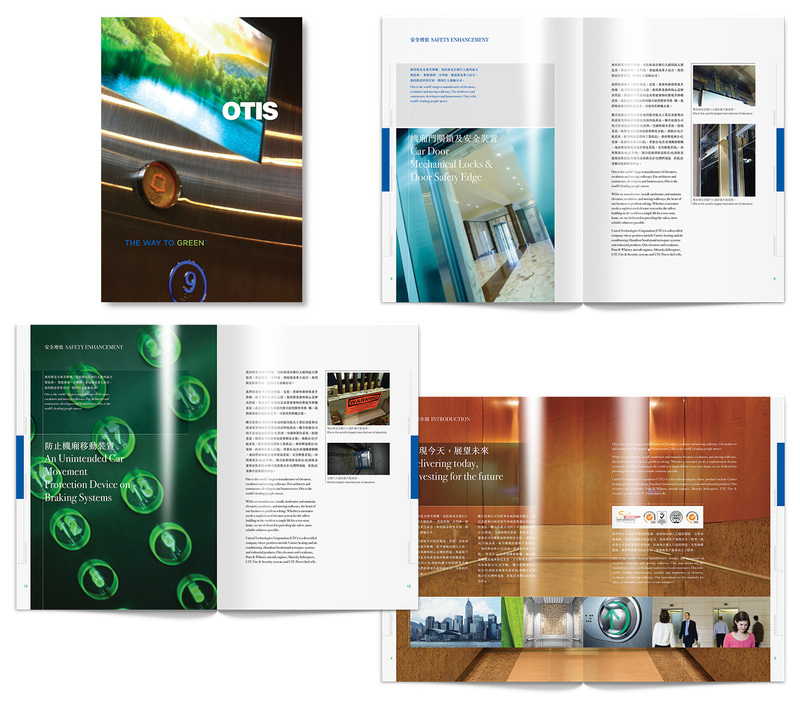 Otis is the world’s largest manufacturer of elevators, escalators and moving walkways. For architects and contractors, developers and homeowners, Otis is the world’s leading people mover. While Otis manufacture, install, modernize and maintain elevators, escalators, and moving walkways, the heart of their business is problem solving. Whether a customer needs a sophisticated elevator system for the tallest building in the world or a simple lift for a two-story home, they are dedicated to providing the safest, most reliable solutions possible. Commitment "the way to green" as the theme of the brochure design, the purpose is to introduce Otis Hong Kong safety enhancement of the elevators to customers including: door detector, car door lock, redundant brake system, rope brake device, CCTV and intercom, obstruction switch, automatic rescue device etc. MTR (Shenzhen) Longhua line insist to their service conception "listen and action" to be a harmoniously society railway, they are value to listening from different society. MTR expect to build the longhua line is not only as travel transportation tool, it is through with the continues communication of society. To build a prosperity community together and make colorful journey becomes everyday, lead the passengers arrived to their destination. 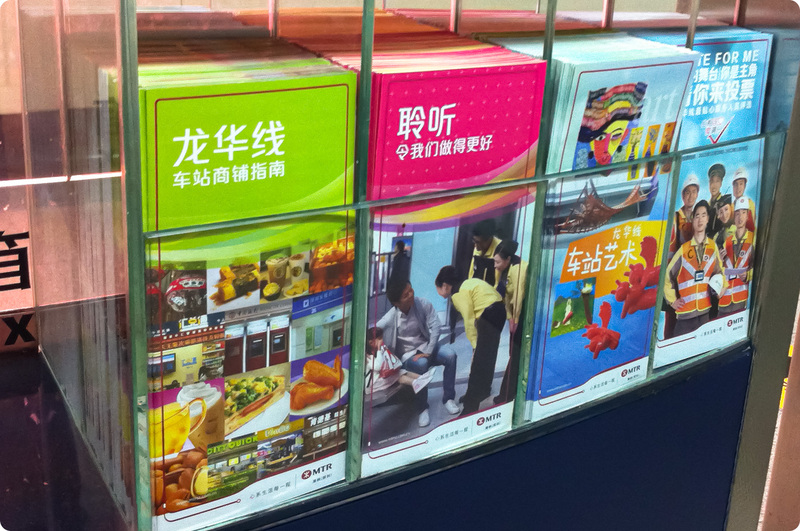 In order to let the passengers know more about MTR (shenzhen) longhua line service, we design various leaflet to introduced the Longhua line latest news and services, such as the society culture, the station facilities, art galleries, shopping guide etc, bring more convenience to passengers. 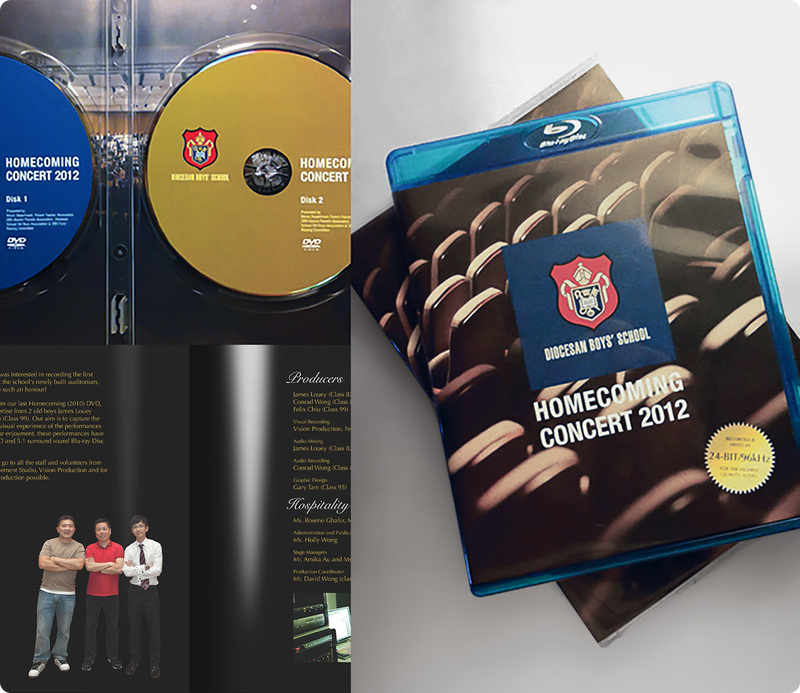 The DBS Music Department, DBS Parent-Teacher Association, DBS Alumni Parents’ Association, Diocesan School Old Boys’ Association and DBS Fund Raising Committee proudly present Homecoming Concert 2012. The Homecoming Concert is an annual event to honour the outstanding achievements of their boys at the year’s Music Festival, with DBS being awarded the “Outstanding School of the Year” and to welcome all new students and parents. They will be a celebration of musicians' labour as well as the wonderful heritage of school. The concert will feature musicians of various choirs and ensembles as well as participation from old boys and parents. DVD cover and introduction booklet design with black brown color tone and wonderful pictures in concert. Especially the cover design, many rows of seats faced to the stage, it like as many people sit here and watching various performances already, the concert is grand and magnificent. Worldex GEC operates as an international network of exhibition firms offering comprehensive range of service to clients, in terms of trade promotional exhibitions and conferences. With a worldwide presence, Worldex group provides global service which links you with the world market. Worldex GEC had six members respectively located in Bangkok, Mumbai, Guangzhou, Milan, Sydney and Macao. All of them have good connection with each other and offer the most reliable services. The six affiliated company in different location of the world, they build a worldwide network and provide a one-stop solution to serving clients. The creative concepts of corporate brochure use six swing steel ball to represent six affiliated company, to communicate and combine into a powerful worldwide network, linking you with the world market. Deep background colors stand out the image and logo. Design style is simply with manner of the lord, we will focus on promoting and their enterprises advantage. The whole themes around the intellectual property rights are base on legal fundamental and credibility, integrity and reliable to service clients, elegant and simplicity design. Become an enterprise in Mainland China, basic Chinese elements with modern design style to present high and grand but stylish. Especially design a box to showed professional impression, make it common brochure to add more trustful and support the idea "Concentrate on Professional, mission will reach". KAM Healthcare Group is a leading provider of hearing healthcare solutions. This active group consists of three sectors namely Phonak Hearing Centre Hong Kong Limited, KAM Hearing Technology China Group, and KAM Hearing Health Limited. The aim of their corporate is to be the foremost and leading professional healthcare group in Hong Kong, Macau, China and other countries in the Asia Pacific regions. Phonak Hearing Centre Hong Kong Limited first started on 1986 as a joint venture (subsidiary company) with the internationally renowned hearing instrument manufacturer Phonak AG, Switzerland. Specifically provide services to children hearing recover, hearing impairment schools and weak hear people in Hong Kong, Macau and hospitals in Mainland China. Their mission is "To do our best, to serve the public, to bestow our professionalism upon the hearing-impaired". With best hearing professional technique and high-tech Phonak hearing aid and world advanced hearing testing instruments, for thousands of weak hear people to solve hearing problems in Hong Kong, Macau, Southeast Asia and Mainland China. To make they broke through the silence, facilitating communication. They are always promote new products and hearing seminars, marketing materials such as DM, product catalogue, membership news, promotional leaflet etc, express the latest activity news and product information to customers. Worldex GEC core service in exhibition stands design and construction, exhibition general contracting and management for organizers, design and decoration for the show room, interior and commercial artic space. With this network they are offer services throughout Mainland China, Hong Kong and Macao, Far East, South Asia, Southeast Asia, Europe and North Africa. Their clientele consists of multi-national companies, industry associations and government bodies. Worldex GEC offer tailor-made solutions, creative ideas and professional services to enhance your participation in trade fairs by providing comprehensive service of design, construction and show management, making us your ideal partner for marketing and promoting your brand in the global marketplace. 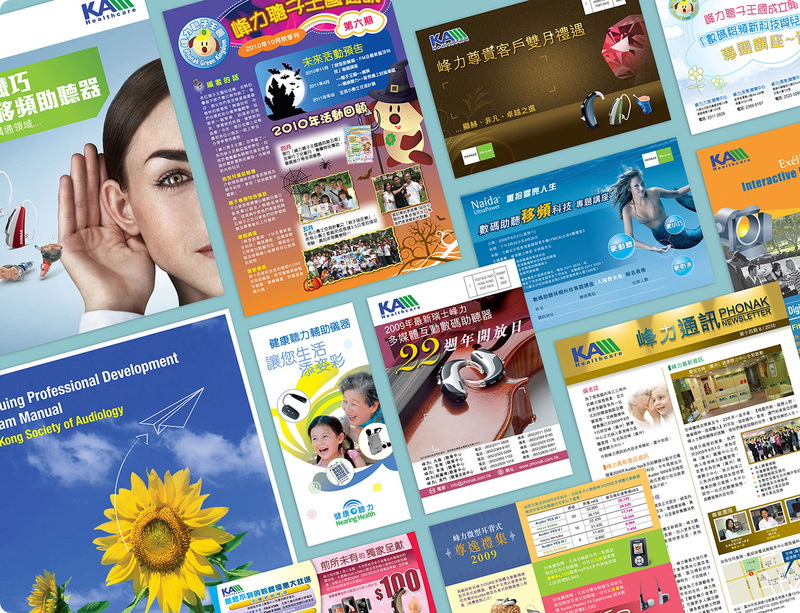 The creative of company brochure originated from their business nature, with 3d geometric graphic respectively represent the planning, design and production are behind the inspiration, and different languages present full service all over the world. 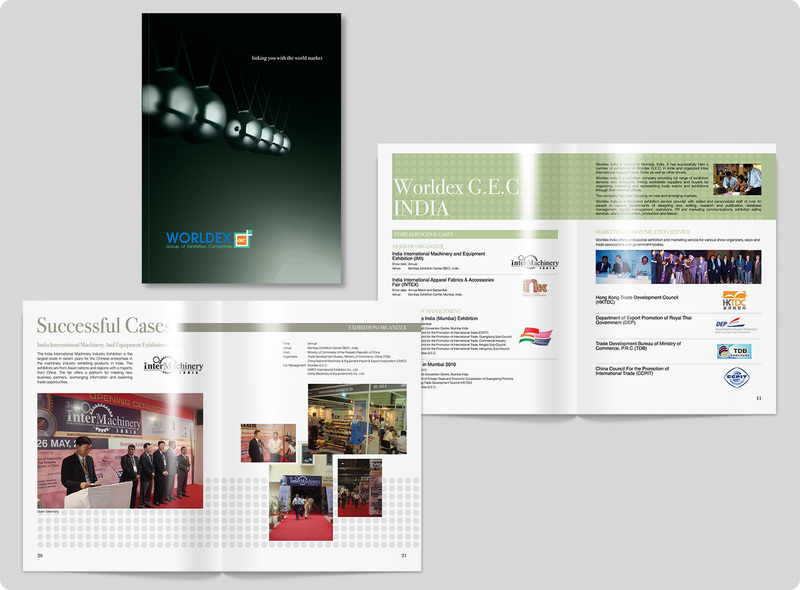 Worldex GEC brochure design in simply style, pure white color design printed on Conqueror texture paper, the brochure outstand corporate branding image. Decades since its establishment in 1954, Wo Lee Steel Company Limited has become a reputable supplier of a wide range of steel materials and products for the manufacturing and construction industries both in Hong Kong and overseas. Wo Lee has diversified to extend its services to include Product Innovation and Processing Center to keep pace with the needs of an ever more demanding market worldwide. In this product catalogue, you will be able to find a wide range of such steel products like Piles, H Columns, Channels, Hollow Sections, Angles, Squares, Rounds and Flats as well as Deformed Bars for construction industry. Their processing centre equipped with the latest technology and monitored by the skilled technicians, all finished products are guaranteed to fulfill customer requirements. The target of this product catalogue is a professional construction company and engineer, catalogue design must very clear to show their business and let the reader to check information more directly. The cover design with dynamic graphic and cool background, inside pages in color section to separate the different product series. We must be very careful to check and arrange a lot of specifications data, make the reader easy to get the details information. EDAW cooperate with resort construction company, through the Hainan local culture characteristic and different inspiration of basic unique environment resources, reinterpret to present landscape design element essence, rebuild a Shimei Bay unique resort position of district, and make this resort district more outstanding in Hainan region. The scheme visual design should show Hainan local culture completely, natural and pure beautiful characteristic. 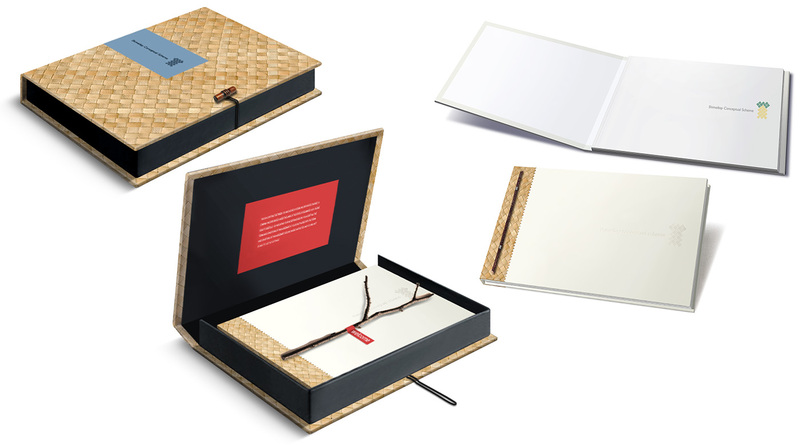 Our design team used a cane woven for packing materials, wooden button etc, design a Chinese and Western style combination outer packaging. Scheme book cover design also with same materials, in order to increase the natural elements. Attach with a branch to represent "Welcome to Shimei Bay". The design has a very good comment and affirmation by EDAW. Fu Yuan Tang health services company mainly responsible to produce a dedicated medical devices, pharmacy, personal articles and RiRi Hong wine. RiRi Hong wine had first approval document of health food in China, now batch production and promote into market. Ganoderma, ginseng, caterpillar fungus, tokay, tuber fleeceflower root are rarity Chinese medicine, and this product materials all the best of similar medical. RiRi Hong wine ingredient contains all effective essence, strong biological activity, easy for body absorbing and effect could be fully utilized. 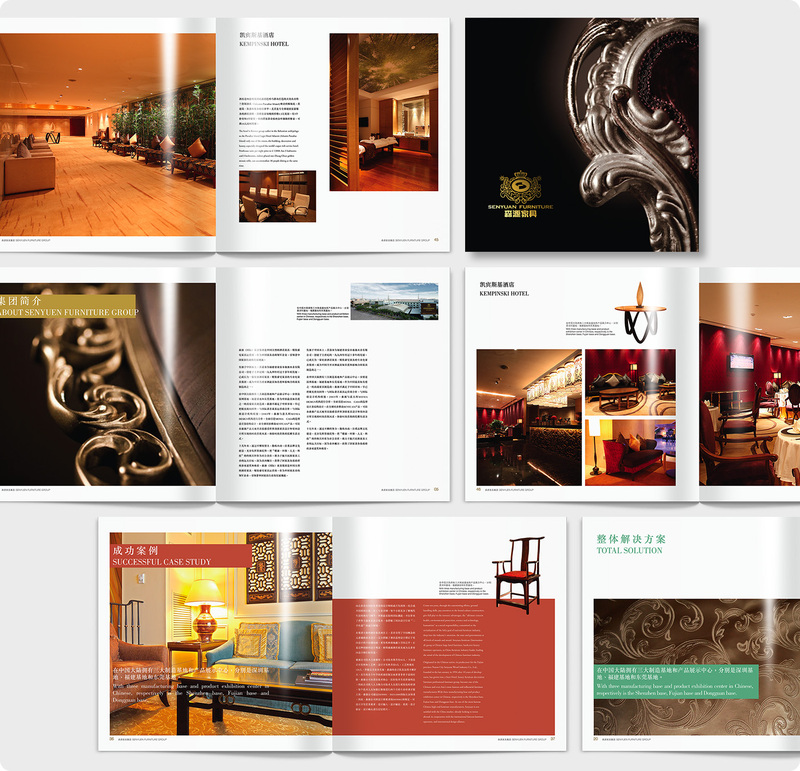 Brochure design with concise layout presentation and traditional Chinese style, generous cover and inside page design represent Fu Yuan Tang brand position in the market. Underpinned by precision mold manufacturing for overseas markets since 2002, HOYU DIGITAL TOOLING (HDT) has sustained rapid business growth and grown into a professional company with an annual production capacity of more than 300 export-oriented sets of molds. HDT is a subsidiary of HOYU TOOLINGS LIMITED which has more than 20 years of experience in plastic injection mold manufacturing. We distinguish ourselves as one of the most versatile mold fabrication enterprises capable of providing exemplary services to our global customers. Continuous added value and self-improvement are critical to our future success. HDT is a Tooling Design and Mold Fabrication company. We adhere to the fundamental principles of professional processes and techniques to efficiently and reliably produce quality molds. As our insight understanding of HDT, We have an idea for HDT corporate brochure is to combine rational and perceptual present. To make a different from the HOYU business and build the new image of HDT. Describe the information and services to oversea market. The global image and graphic designed to present communicate and combine into a worldwide network. Wing Tai Plastic Works has over 30 years experience in Halloween and Carnival toy's manufacturing. They carry over two hundred items and new designs are launched every year. Products include assorted plastic weapons, swords, cutlasses, daggers, crowns, tiaras, native American accessories, pirate accessories, ninja accessories, princess jewelries and Halloween accessories. Customer's designs are also welcomed. Halloween is one of the important foreign holidays, the holiday popular in Europe, America, Australia and other countries. On that night child will wear a strange suits and masks. Hanging pumpkin lantern in front of the door, put a skeleton mask on the face, they went door-to-door to collect candies and celebrate. 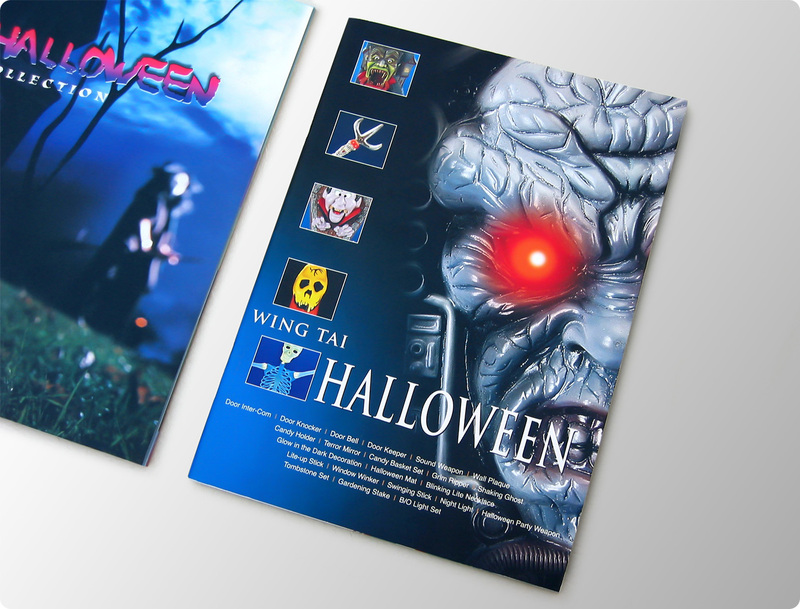 Halloween product catalogue with horror and frightening image to make festival atmosphere, describe the features of the product completely, it make Wing Tai Plastic Works received many orders in next year. JOYAZ is a gift design company and manufacturer, products mainly export to oversea market. It is include office accessories, watch and fine jewelry. The branding position in high-class. Product catalogue designed with PVC material, outstanding a famous brand image and describe the products information very clearly. The design has a very good comment and affirmation by JOYAZ. Wan Cai Hong Kong Limited was established in 1994 which owns a number of factories in Shenzhen and Guangdong Province dealing with coloring dyestuff. With unparalleled standard of service, quality of products, attention to detail, professional dedication and accumulated experiences, many famous global brands remain as loyal customers of Wan Cai. The company had a great team and sale service department. Their human productivity group consist a team of engineers, colour specialists and technicians, cooperate with more than two hundred enterprises to establish a good partner relationship. Wan Cai emphasizes in strong and resilient team work to put out customers first and foremost, providing the best colour products to the marketplace. Promotion campaign concept use "We bring you into the colorful world of plastics" as the slogan, such as a child pure character relaxed to present the theme, lively and lovely, colorful image and graphic let the promotion campaign successfully. NETEL Technology (Holdings) Group is principally engaged in the business of multi-media, value added telecom and information services. The Group is evolving from IP based telecom services to multi-media applications that include but not limited to job search engine, cyber education, working with China Central Government National Development and Reform Commission: China Information Times and IP services platform. The Group is holding ICP telecom related license in China, IP phone telecom license in the Philippines, SBO network license in Hong Kong. The above licenses equip the Group to carry out the business as stated. 3G Lab is the R&D laboratory for Netel and through this Lab, Netel is able to generate new services to serve the community. 3G Lab is the full subsidiary of Netel headed up by experienced research team in related field. 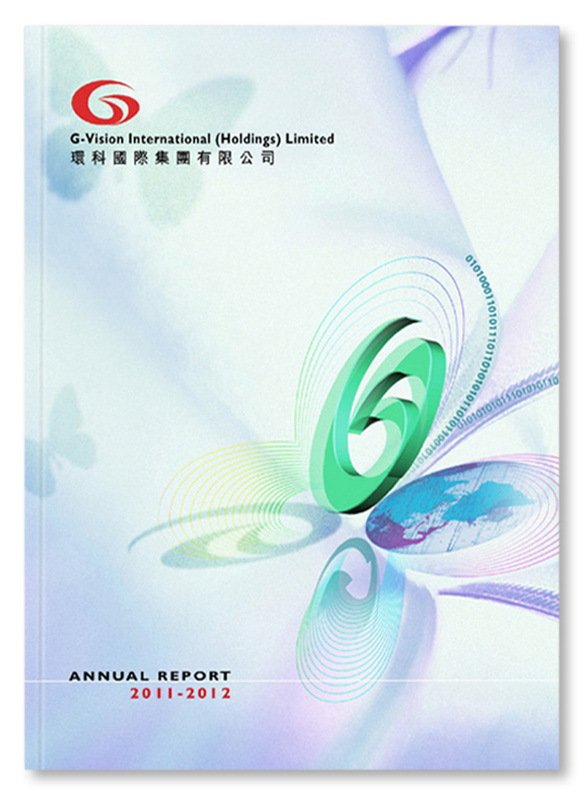 Annual report is a periodical publication in each year. According to the HKEX and SFC rule, must submit shareholders of the annual financial statements. Annual report included the description of companies operating conditions and assets, liabilities and earnings report. Annual report designed in high-tech concept, inside pages printing on metallic gold color, represent the group generosity and dignity. PDP-503MXE super black plasma display show more deep black image, new colorful optical filter intensify the color purity, new intelligent optimization mode can help the graphics optimization, lighting sensor automatically balance interior lighting conditions. 1920 x 1080 resolution, 1080p digital HDMI input, a new design of remote control makes operation more convenient, multi-lingual operation interface and ultra-thin body design. 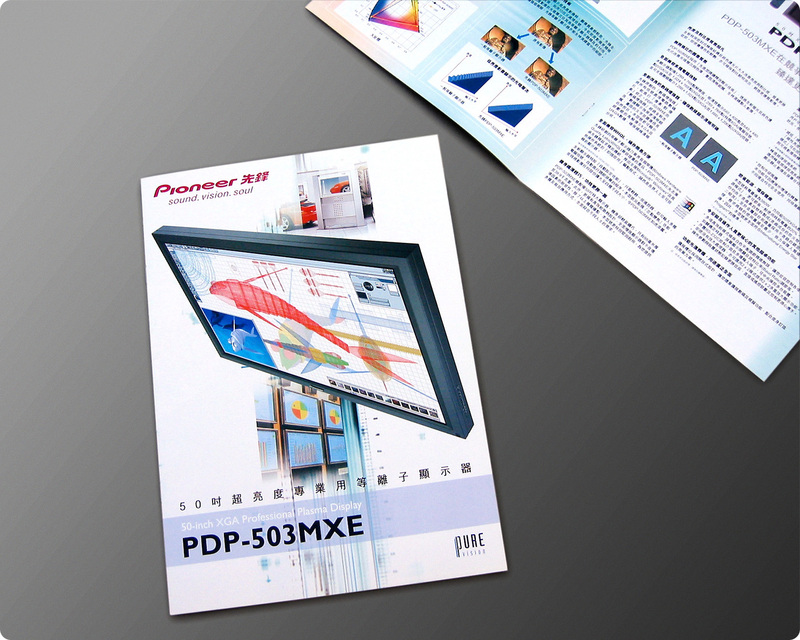 Product catalogue design shows the PDP-503MXE plasma super wide display function, and products detail specifications. Established in 1992, Eastern Gotech is a subsidiary of the Singapore listed company, NSL Group. NSL is the market leader of chemicals, engineering and construction industries in Asia Pacific. By introducing state-of-the-art technology and automated production system from Europe, NSL has set up plants in Asia to manufacture the best-selling E-MIX dry-mixed plaster and mortar throughout Asia for over 20 years. E-MIX is currently the largest dry-mixed plaster and mortar brand name in Asia and Hong Kong, taking over 80% of the local market share. E-MIX has variety of series and products, they need a product manual which had products information and details, can insert the new products information anytime. Yacca created a box file manual design for update anytime, design with green environmental concept, and different color bookmark to separate different series products, more convenient for user reading. G-Vision Group established its first restaurant in 1984. The Group is currently engaged in the operation of Chinese restaurants in Hong Kong which specialize in Chiu Chow cuisine. From 2002, the Group diversified its business into the production of the environmental friendly paper pulp tableware and packaging made of sugarcane fiber, bagasse and post-consumer recycled paper. Cover design with environmental protection and technology as the theme. A beautiful butterfly image with a combination of various elements, it is including the company logo, recycle logo, earth, digital graphic etc, represent the G-Vision group, and globalize business, environmental protection and technology.